“Aléatoire bêtises français.” Or, for the English speaker, “We love wine.” It’s the spice of life, a girl’s best friend and it completely makes the heart grow fonder. Yeah, yeah — we know those aren’t the sayings. Don’t ruin this for us. We’re trying to have Wine Wednesdays be a thing in the office, so be cool and read the best wine spots in Vegas. Aureole’s wine tower. Photo courtesy of Aureole. The beautiful bar area of D.O.C.G. Photo courtesy of D.O.C.G. Let’s just go ahead and name our new bar and restaurant after the absolute highest quality of Italian wine possible. That must be the conversation Chef Scott Conant had at some point. And we’re sure glad he did. A restaurant called “That Stuff You Tried to Make Yourself in the Kitchen Sink” probably wouldn’t do as well. 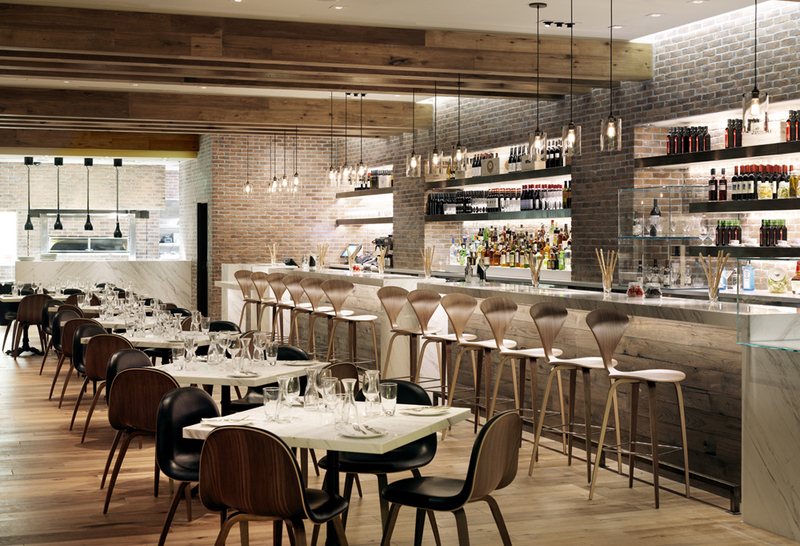 Inspired by Italy but fitting perfectly in the Cosmopolitan of Las Vegas, D.O.C.G. is as delightful to eat at as it is time-consuming to type. When you want some high quality selections in a more laid-back atmosphere than you’ll usually find accompany wines of that caliber, D.O.C.G. is the place to be. Their wine list pairs perfectly with the full dinner menu or the quick lunch menu. Have a glass or two and savor something simple in the afternoon or buy a bottle and enjoy a relaxing dinner. The place for wine in the Palazzo shops. Photo courtesy of Double Helix Wine & Whiskey Bar. We’re not making a play on the name when we say that Double Helix is actually two bars. We also don’t know if they planned that. 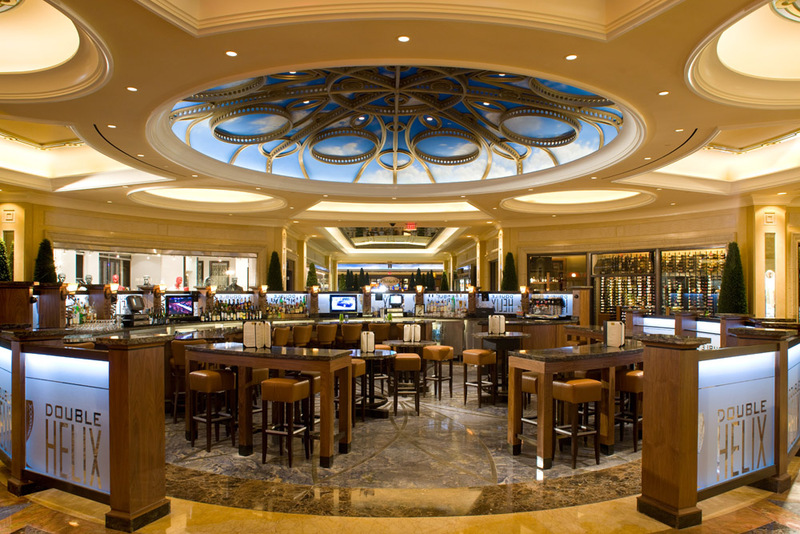 But Double Helix Wine & Whiskey Lounge at Town Square and Double Helix Wine & Whiskey Bar at Palazzo are both fantastic drinking spots where you can get away from the bustle of shopping. 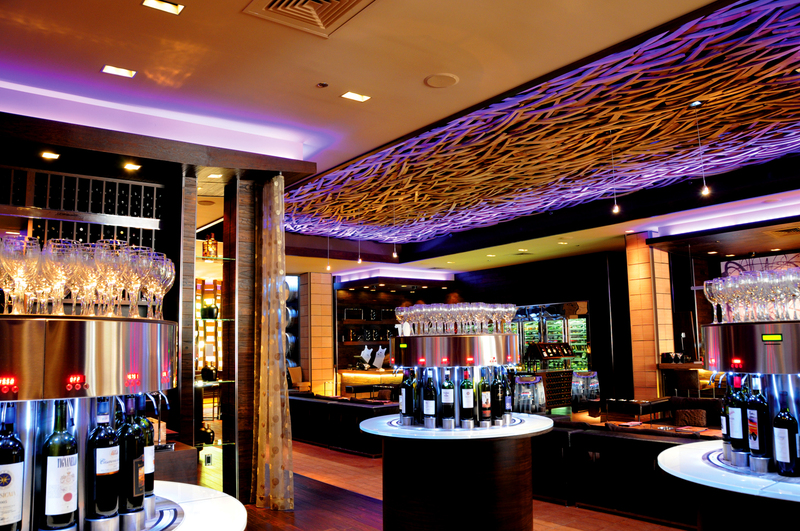 Both bars have brilliant wine lists and expert staff to help you choose the best wine for you. Or you can just let them pick and trust they know what they’re talking about. That’s what we usually do, but we like being surprised—like when you’re walking through the Palazzo shops and find an awesome wine bar in the middle of the room. Whichever Double Helix you pick, you can be sure you’re going to have a fantastic glass of wine. You can drink wine but you cannot ride the Vespa. Photo courtesy of Monte Carlo. Here’s another Italian restaurant and bar that really knows how to live it up the way we all assume Italians do all the time. But d.vino at Monte Carlo is as much Vegas as it is Rome. The menus are authentic and bring in fresh ingredients to ensure a meal you won’t forget. And the wines work so well you might forget that they weren’t designed just for you. The whole experience at d.vino is a cool and casual while still evoking the sophistication you expect from a posh wine bar. And you can even get half price bottles during their Red Sauce Sundays events. It’s a fantastic opportunity to score a bottle you might not otherwise pop for, but really should. After the first sip you won’t have anything to regret. The wine of Ferraro’s. Photo courtesy of Ferraro’s. Just off the Las Vegas Strip, across Paradise Road from the Hard Rock Hotel, is a local restaurant called Ferraro’s, and we love it. We love the family atmosphere and the fact that they’re open late. We can score some divine gnocci al pesto at midnight. But what we’re here to mention is the wine. 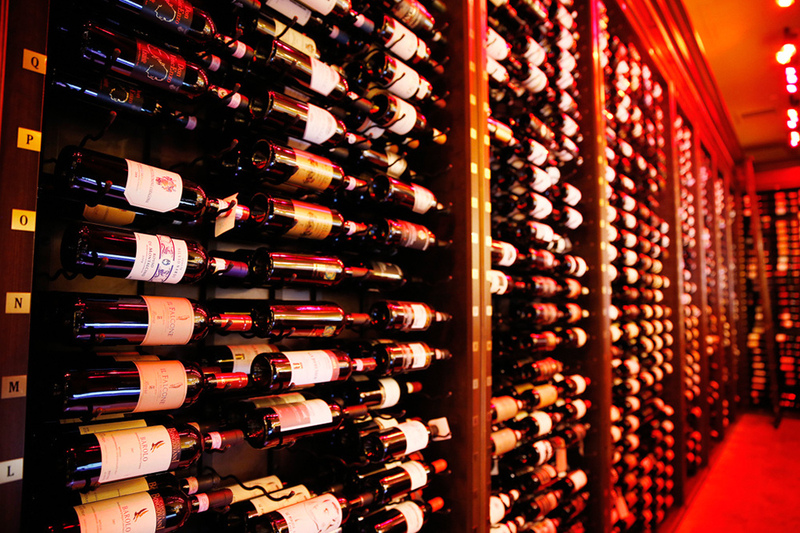 The wine list is long and lovely, offering varietals from around the world. And the staff is more than just knowledgeable — they take pride in the establishment’s ability to give you the meal of a lifetime. Ferraro’s is the place to go when you want to feel like your taste in wine matters, even if you don’t really know what you’re talking about, because everyone there will treat you like family. And, even though it’s not wine, treat your table to a shot of limoncello after dinner. Your server might even join you. Try all the wines you want at Hostile Grape. Photo courtesy of Hostile Grape. A taste of what’s waiting at La Cave Wine & Food Hideaway. Photo courtesy of Barbara Kraft and La Cave. People watching is perfect at Otto Enoteca. Photo courtesy of Otto Enoteca Pizzeria. 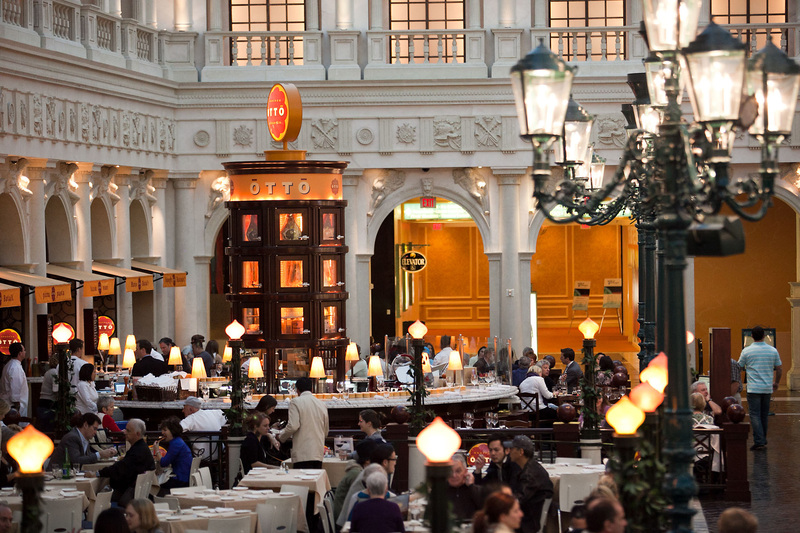 In St. Marks Square in the Grand Canal Shoppes at Venetian, Chef Mario Batali has placed a casual eatery which fits perfectly in the space. 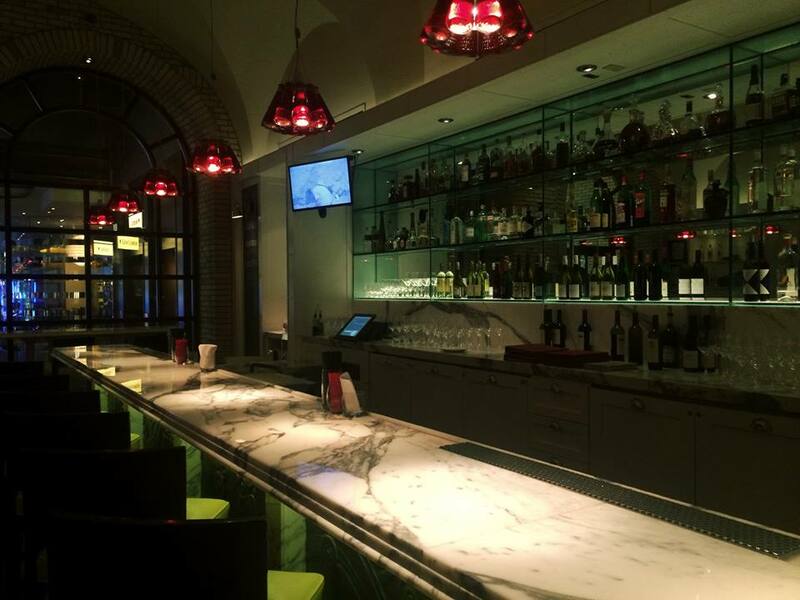 Drinking at Otto Enoteca is as easy as sitting down at the beautiful marble bar and ordering your favorite style. With 100 bottles to choose from, you might find yourself tasting a variety and working up a hunger for some delectable pizza. Stop in during your shopping spree or sightseeing and you’ll find a place to rest your feet and fill your belly with all the wine you need to stay energized the rest of the day. Turn around in your bar stool and people watch or talk with the experienced staff all about wine and how it pairs with pizza. Then drink and eat more. That’s really why you’re here, after all. The sultry bar at Portofino. Photo courtesy of Portofino. We’re throwing in another Italian restaurant because we know how well they work with wine. When you’re savoring a glass of red with the coastal Italian menu at Portofino in Mirage, you’ll see why we’re so in love with Italiana. Portofino is less about the quick glasses of wine that some other entries may be great for. You’ll want to spend a little while in this spot. You won’t have to worry about the casino spilling over into your meal. And you’ll know that you’re in good hands with the expert staff. This is the night to take yourself away from everything else and remember just how flourishing a good glass of wine can be. Let it lift your spirits and carry you aloft into new delights. This is where want all our wine. 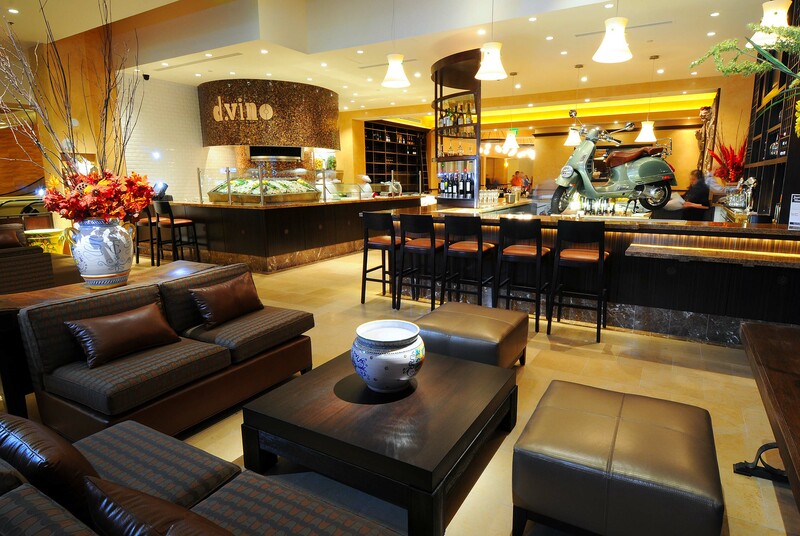 Photo courtesy of Wine Cellar and Tasting Room at the Rio. We told you we’d get to a real wine cellar eventually. Sorry it had to be last. Blame the alphabet. 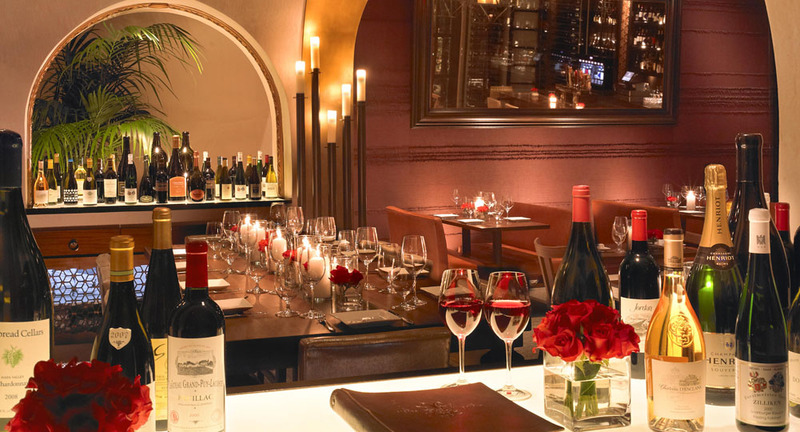 The Wine Cellar and Tasting Room at the Rio has one of the finest wine selections around including more than 100 wines by the glass. They also have some wonderful “cult wines” that you might not find elsewhere. 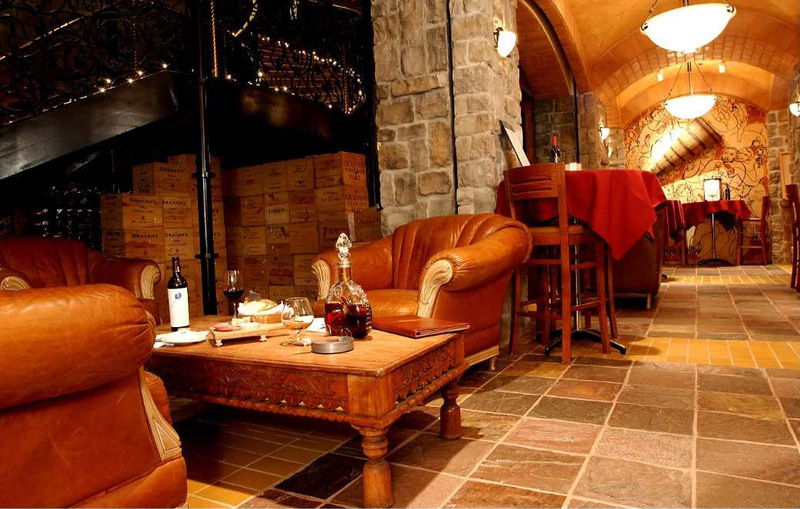 In addition to the small bites and cheese available for pairing, the Wine Cellar and Tasting Room gives you the wine experience that’s probably flowed through your head when you think about stepping down into a wine cellar and trying something you’ve never dreamed of before. The space is casual and rustic but definitely knows all about wine. Come here to relax, cool off and just drink wine. What else do you really need to do when you’re in Vegas? And if you’re only sort of into wine but love to drink other things, check out our guide pages for the best whiskey spots, beer joints and dive bars. You’ll find something that speaks to you.